Discovering you have been the victim of a burglary is one of life’s less pleasant experiences – but FC Locksmith – open 24 hours a day, 365 days a year – promise that we will make it our priority to reach you as quickly as possible and re-secure your door locks with the minimum of fuss. 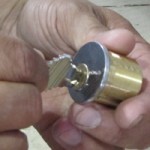 As well as repairing and replacing door locks we at FC Locksmith can re-key your locks. This is particularly advisable if you have just moved into a new house and is a service which sometimes surprises our customers in terms of the speed and cost-effectiveness of the process. With no need to spend money on costly hardware, locks can completely individualized no time at all. FC Locksmith provide locksmith services for any type of door lock you can imagine, from front doors, patio doors, garage doors and safe doors. 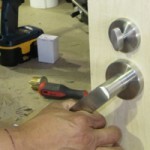 Our highly skilled personnel are knowledgeable about every kind of door lock you can imagine, so you can rest assured that we will resolve any requirement you may have. We also believe in taking preventative security measures when it comes to door locks – either for residential or commercial premises. Which is why we offer a consultancy service whereby one of our friendly security technicians can visit your property and give you an honest appraisal of how well secured it is. We can recommend the replacement or upgrading of door locks, or advise you whether it would be beneficial to add further door locks.